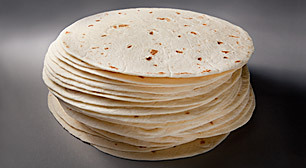 Our 8” flour tortilla is made for the classic burrito. 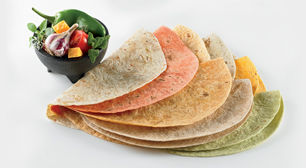 Just add protein, rice or beans and your authentic Mexican entrée is ready to serve. Master Case Net Weight 14.00 lb. Master Case Gross Weight 14.86 lb. Enriched Bleached Wheat Flour (Flour, Niacin, Reduced Iron, Thiamin Mononitrate, Riboflavin, Folic Acid), Water, Vegetable Shortening (Interesterified Soybean Oil, Fully Hydrogenated Soybean Oil), Contains 2% or less of the Following: Sugar, Salt, Baking Powder (Sodium Bicarbonate, Corn Starch, Sodium Aluminum Sulfate, Calcium Sulfate, Monocalcium Phosphate), Vital Wheat Gluten, Monoglycerides, Potassium Sorbate and Calcium Propionate (to preserve freshness), Fumaric Acid. Contains Wheat.